Standard alarm clocks are not very effective at waking people with hearing loss, especially those who are severely hard of hearing or deaf. 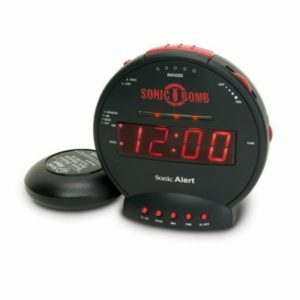 The alarm clocks we carry are designed with a combination of special features, such as extra loud alarms, bed shakers, and lamp flashers that are guaranteed to wake you up! Extra Loud Audible Alarm: Almost all of our alarm clocks can wake you up with an extra loud audible alarm with adjustable volume and tone control. Bed Shaker: Most of our alarm clocks also come with bed shakers, which are placed under your mattress or pillow. When the alarm is activated, the bed shaker will vibrate to wake you up! Lamp Flasher: This feature allows you to plug a lamp into your clock. When the alarm is activated the lamp will flash on and off. If you are looking for a clock with this feature, just look for our handy lamp icon! Click Here to view all of the Alarm Clock.